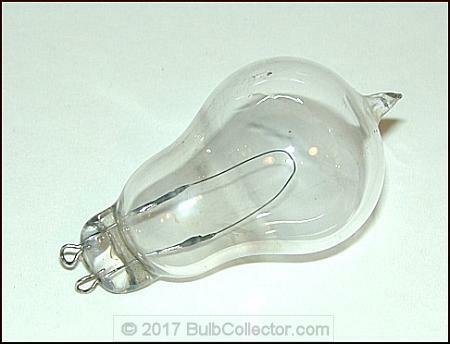 This small European wire terminal lamp is meant to be used with a spring tension socket. This lamp is European in origin and dates to the late 1880s or early 1890s. The lamp has a square cross section suggesting a carbonized bamboo filament with long platinum lead in wires that exit through the bulb to form the two small loops that electrically attach and secure the lamp to its socket. The size of the lamp (about 3cp) tells us this could have been used for decorative lighting, lantern service, or for science experiments. It's unknown to me if this lamp was produced in the Netherlands, or by DeKhotinsky in another European country.